Austin Kleon’s Steal Like an Artist has been a huge influence on me, helping me get past a lot of creative blocks I’d set up for myself long, long ago and then hit my head against ever since. But after reading this post quoting David Bowie, I had one of those flashes of insight that feels like the walls of the house in your head are being blown apart, an explosion of clarity. Why do I have such a difficult time coming up with plots for stories? I’ve long said it’s because it’s just hard for me to come up with plots, but what I meant was that it’s hard for me to come up with original plots, rather than copying the plots of other people’s stories. Why do I have such a difficult time creating characters? Because it’s hard for me to come up with original characters that aren’t clearly other people’s characters with the serial numbers (barely) filed off. Why can I be zipping along with my writing and suddenly slam into a barricade of “what words do I use next? OMG I CANNOT WORD AT ALL!”? Do I really have the oh-so-dreaded Writer’s Block? No, I’m just afraid of using other people’s words instead of being original. It’s monstrously stupid and a big, fat lie. But it’s a lie that is very powerful in our society’s narrative about creativity, and even after reading Steal Like an Artist, it’s been hard for me to truly see that narrative embedded within myself and break free from it. One of the things people have always said most about David Bowie is “he’s such an original!” And yet, he didn’t think he was. He was consciously and happily stealing from everything and everyone around him that he found cool and exciting. He didn’t even try to hide it. He wore his influences on his sleeve. But the way he used what he stole, they way he expressed it, was what people saw as original. 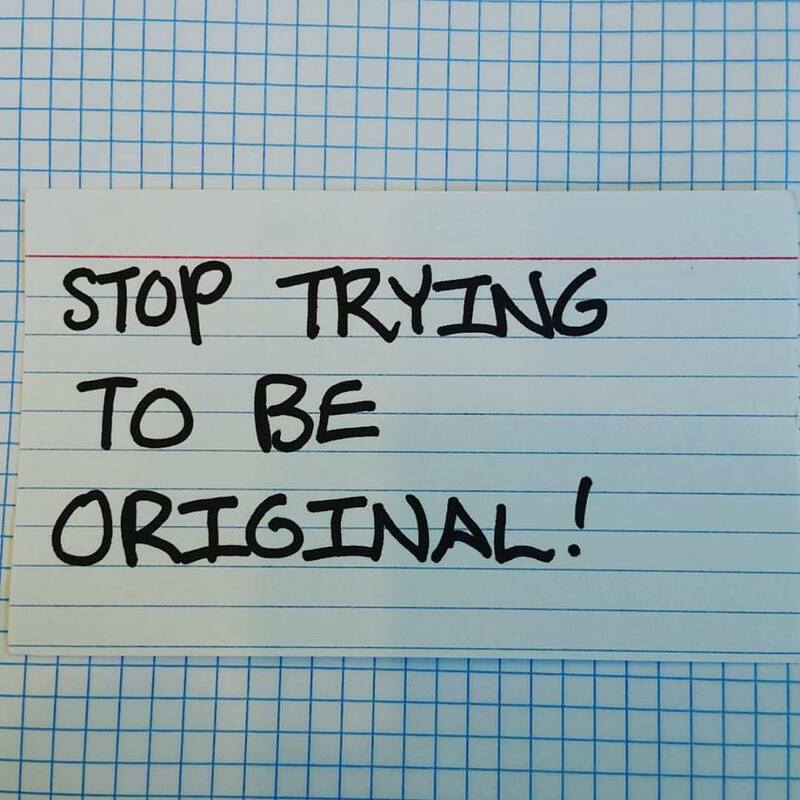 I’ve been trying so hard to be original for way, way too long. When I posted my note on Facebook, a friend said sweetly, “Because you don’t need to try.” And she’s absolutely right. I just need to trust that I’ll be original in the way I steal and the way I use what I steal. (Neil Gaiman calls his story “The Return of the Thin White Duke,” a tribute to David Bowie, “unabashedly fan fiction.” At the same time, it’s an utterly Neil Gaiman-y story–an original–from start to finish.) Like so many huge, slippery concepts–happiness, love, being cool–originality is something you only really find when you stop trying so hard to get there. Like so many things in life, it’s something I need to worry about less and just get on with doing. And so I keep passing notes to myself in Overthinking Things class, waiting for the messages to sink in, like this one has. This was written by josh. Posted on Monday, January 18, 2016, at 8:31 am. Filed under creative process, inspirations. Bookmark the permalink. Follow comments here with the RSS feed. Both comments and trackbacks are currently closed.